“Super Star K7” First Episode Achieves Both Fun and Sensation: Will It Revive Its Golden Age? 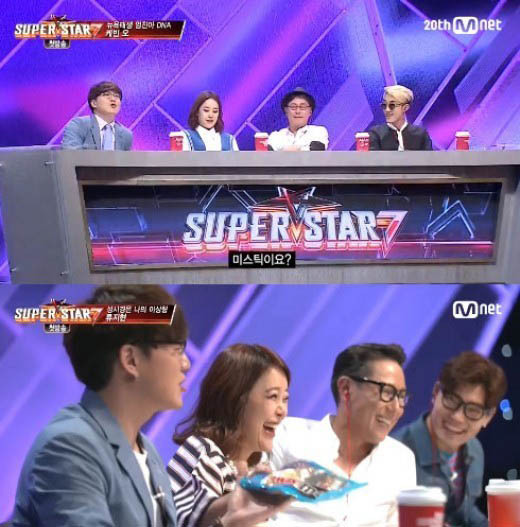 Mnet’s “Super Star K7” kicked off on August 20. The panel had a change of members: Lee Seung-chul parted ways after six seasons and Yun Jong-shin, Baek Ji-young, Kim Bum-soo, and Sung Si-kyung joined the team instead. From the very first episode, the show featured some powerful contestants who could well make it to the finals. Eighteen-year-old Yoo Yong-min stole the heart of Yun Jong-shin with his self-composed song. “He’s a great composer. He has something that Kwak Jin-eon does not have,” commented Yun Jong-shin. Another contestant who stole the spotlight was the “all-around-perfect boy” Kevin Oh. An Ivy League student, Kevin impressed the studio with his guitar and singing skills. Yun Jong-shin, saying that he has a “mystic style,” clearly expressed his wish to take the contestant in, and rookie judge Sung Si-kyung showed his interest in Kevin as well, saying that it was high time for him to start producing as well. “Super Star K” succeeded in grabbing the viewers’ attention by introducing highly talented contestants in the very first episode. Instead of going with “the infamous editing,” the program seemed to focus on the talents of the contestants. Another interesting part was the chemistry between the judges when talented contestants appeared. Sung Si-kyung took over the role of Lee Seung-chul, who was famous for his harsh criticisms. When a high-school contestant who introduced herself as Sung Si-kyung’s die-hard fan tried to offer him chocolate, the singer curtly replied that he will decide whether to receive the chocolate or not after listening to her performance. But he made everyone in the studio laugh when, impressed by the student’s stage, he gulped down the chocolate. Sung Si-kyung and Yun Jong-shin in particular showed a Tom-and-Jerry chemistry, so when the former showed interest in a contestant, Sung Si-kyung quickly intervened. But the show was not without its flaws. The judges were almost in a competition to praise the contestants, and the biting words that had become a trademark of “Super Star K” were hard to find in the first episode. “Super Star K” will now have to show the viewers whether it can bring back the popularity of its golden days by discovering talented musicians while making the process both fun and sensational.